The Sistema has an interesting history. Manufactured in Argentina from 1927 to around 1960 with Colt-supplied tools, it had parts interchangeable with any other standard government model, unlike the Ballester-Molina which also comes from Argentina. When the Argentine military changed pistols in the late 90s, their Sistemas were arsenal-refinished for sale in the U.S. at $300 or less. When I found that price for a Sistema online, it seemed too good a deal to pass up, especially after I’d heard positive things about the pistols from a local gunsmith. Mine turned out to be a decent shooter for the money, if a little quirky. That Sistema had the usual markings. Along the left side of the slide was a row of letters: “D.G.F.M. (F.M.A.P. ).” These stood for Direccion General de Fabricaciones Militares (Fabric Militar de Armas Portatiles). On the right side was “SIST. COLT 11.25 mm MOD. 1927. It had been manufactured in the late 50s, then had apparently sat unused for most of its career. The pistol arrived at the gunsmith’s with near-perfect Parkerizing, a pristine barrel whose serial number matched the others, nice walnut grips, and a lock-up as tight as a tick. The aftermarket magazines that had come with it were obvious junk, so I replaced them with two surplus USGI mags. They worked fine, with only a few failures to feed or eject, either with ball or hollowpoint. After about 1,000 rounds I had the gunsmith add new sights, re-contour the feeding ramp, and sweeten the trigger a little. I still liked the gun, but by then I’d found out a few things. Purchasing actual U.S. military surplus magazines had been a lucky accident. With any others, the pistol was almost certain to jam trying to eject the last round, and the gunsmith never could figure out why. I learned this the hard way with two McCormick 8-rounders I had bought for IPSC matches. They simply would not function properly in the Sistema, though naturally they worked fine in other people’s 1911s. Meanwhile the gun was getting a lot looser, and I had begun to notice a few metal shavings on the interior of the slide where it fitted into the top of the barrel. 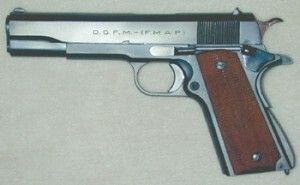 Somebody explained that the equipment Colt had supplied in 1927 was only able to handle the softer steel of that era, so later models could not be made of newer, harder metal. Therefore the pistol was going to wear faster than is usual with today’s guns, and as a result wouldn’t ever be very accurate. (I was amazed at what a friend’s target-tuned Kimber could do in comparison.) But it was a plain military pistol after all, and I consoled myself with the price difference while continuing to have fun plinking and stumbling my way through practical matches using a couple of extra USGI magazines. As time went on, my greenhorn mistakes and mishandling gave it a combat-worn appearance, but that only made it seem full of character. Finally a guy who liked how it felt in his hand offered me more than I had paid for it, and that was that. He’s using it as a glove-box gun for his old pickup, and I’ve upgraded to a target-grade Springfield Loaded, so we’re both happy. All in all the Sistema wasn’t a bad first .45—cheap enough to ding up as I gained experience, and fun to shoot despite its eccentricities.